In just a little over a month, tens of talented artists from many well-known bands and projects will join their forces to create a third installment of a one-of-a-kind event that raises money for the 320 Changes Direction foundation, started by Talinda Bennington, the wife of the late Linkin Park singer Chester Bennington, that focuses on helping those who suffer with mental health, depression and addiction issues. Amongst the performers will also be musicians such as Lauren Mayberry & Mark Doherty (CHVRCHES), Adrian Young (No Doubt), Scott Shriner (Weezer), Jesse Hughes (Eagles of Death Metal), Stephen Perkins (Jane’s Addiction), Carmen Vandenburg & Rosie Jones (Bones UK), Dave Kushner (Velvet Revolver), Marko Desantis (Sugarcult), Keith & Michael Jeffrey (Atlas Genius) or Pierre Bouvier (Simple Plan). Tickets for this event ($43) go on sale on April 18th, at 10am local time. 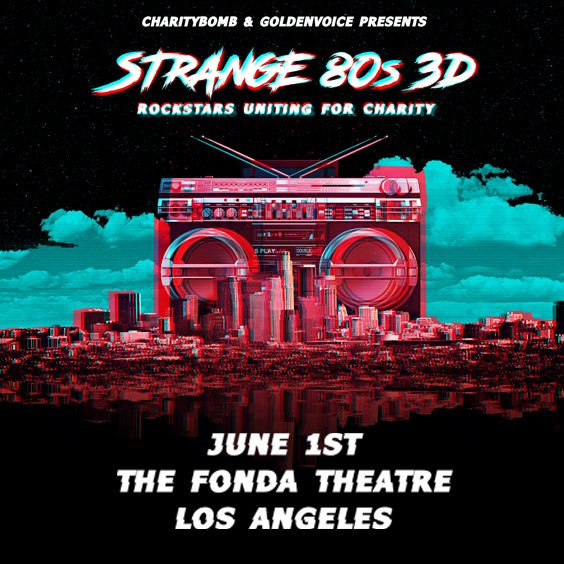 More information about ‘Strange 80s 3D’ can be found on the event’s website.